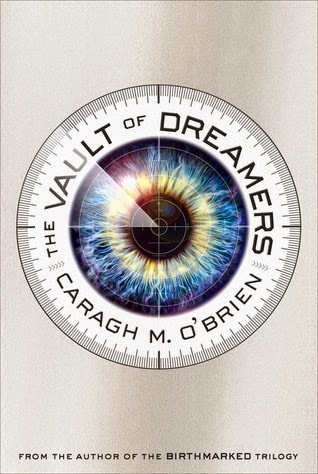 The best part about The Vault of Dreamers is its unique and suspenseful story. Rosie is one of the select few students chosen to attend The Forge School, the most prestigious arts school in the country. The catch? It's filmed 24/7, broadcasted on live TV and viewers get to decide who stays and succeeds. Oh and students are given pills every night which makes them sleep for 12 hours to supposedly enhance their creativity. But one night Rosie skips her sleeping pill and it completely changes her view on the Forge School and its accompanying show. She can't help but think something terrible is going on behind the scenes and that the school is hiding something from them all. The author did a great job of building the Forge School. There were so many details about how the show works, the school, the creative regimen for its students. For students to be able to stay in the school, you have to make the TV audience like you and this is something each student, especially Rosie (as she starts off being one of the least liked) are constantly aware of. It makes you wonder who's real and who's just playing it up for the camera. I was really intrigued by where everything was leading. As Rosie uncovers one mysterious thing after another -- she and us, as the readers, don't know what to believe. I normally don't speculate but even I was coming up with my own theories until the very end. I can't say that I do. I had high hopes for this one but I know I won't be continuing the series. It's a great premise but something was just missing for me. Best dream would probably be the one where Pacey Witter / Joshua Jackson was my boyfriend. I do not remember anything else about that dream except that we were dating. And really, that's all I need to know. As for my worst nightmare.. I can't think of a specific one. As a kid, I actually used to have a lot of nightmares and thankfully I grew out of it. I do have another memorable dream that sticks out in my mind for some reason though. I'm walking around New York and I see this guy who I used to have a complicated relationship with. I turn around and start running. He chases after me. Then I decide to confront him and.. wave my magical wand at him as he transforms into Harry Potter. I can't even begin to interpret that dream for you. But there you go!